Using the latest data from the top 100 largest U.S. cities by population, expert analysts have crunched the numbers and compiled a list of the best cities to relocate to if your rent is too high. The study uses median market rate rent information provided by Yardi Matrix, a leading apartment market data tool, and the median income of renter-occupied households, as published in one of the latest official reports from the U.S. Census Bureau. Why market rate rents instead of the overall median? As the number of affordable units is very limited across the US compared to the demand, analysts considered including the affordable housing segment into the calculations as unreflective of the real market conditions. Miami-Dade County city of Hialeah, where you’d typically be making only $22,357. Compare that to the local median rent and you get a petrifying 57% rent burden—way higher than the 30% limit of acceptability! Sadly, Hialeah is far from the only city that’s facing a serious rent crisis. In Jersey City, NJ the average renters’ household makes a median income of $47,606 a year, but $107,960 would be needed to comfortably afford the rent. Cities like Boston, MA are even worse. You’ll need $120,200 to make a decent living there, while staying in a rental property, but your household will probably only make about $41,622 a year in reality. In other words, you’ll need to somehow scrounge up another $78,578 in addition to what you make just to be able to say you can afford your rent! How can anybody expect to live under such harsh financial circumstances? Bakersfield, CA was recently named “the state’s least expensive metro” by the Legislative Analyst’s Office (LAO), and Forbes has hailed it as one of “The Best Places for Business and Careers”. Perhaps this is why the rent burden is below the red zone. Your household will be able to make about $40,446 living here, and you only need $34,000 to reach that 30% rent-to-income ratio, which means you can either rent an above-average apartment, or happily pocket the $6,446 difference. Irving, TX successfully remained well under the national unemployment rate for the year of 2016, and 2017 is looking to be another stellar economic period as well. The city’s production, transportation, and business management sectors all greatly expanded in 2016, according to regional Bureau of Labor Statistics. 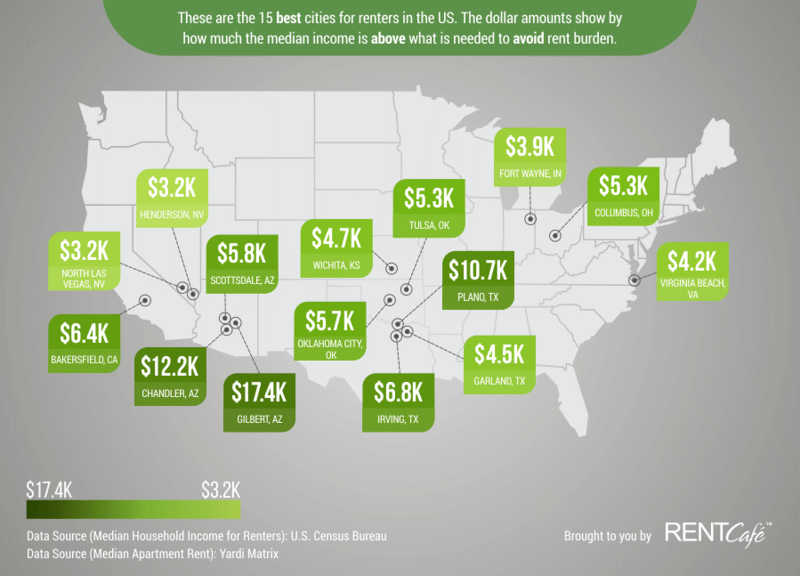 The study shows that when living in Irving, TX you’ll likely enjoy a $46,029/year income, and only have to pay $39,200 towards rent. This makes for a surplus of $6,829! Plano, TX is home to five Fortune 1000 Headquarters, including the ranks of J.C. Penney, Dr. Pepper Snapple Group, and Rent-A-Center. Other major corporations such as Hewlett Packard Enterprise, Intel Security, and Frito-Lay all employ over 1,000 workers. Great career opportunities abound. Renters’ households make a median income of $57,935 a year, but $47,200 would be enough to afford their rent without a problem. This leaves the average household with a difference of $10,735 to save for the future each year. Chandler has been enjoying a multifamily development boom in recent years, and in 2016 they approved a massive lakeside residential complex in the downtown district called the Arista at Ocotillo. The plans call for a total of 210 apartments (115 one-bedroom, 87 two-bedroom and 8 three-bedroom units), which will surely relieve the tension even further. The average renters’ household already takes home a $53,972 annual income, $12,212 more than the $41,760 needed to avoid being rent-burdened. Workers here enjoy a strong educational background and excellent job benefits. The city population has been doubling every five years since 1980, and with it, an ever-expanding workforce. Renters in Gilbert make a median household income of $58,166 a year, but need only $40,720 to afford rent. The extra $17,446/year is plenty of money for some fun in the sun!